This week, May 13-19, is Women’s Health Week. If you have been a devoted reader of my blog, even for just a little while, you are well aware that I am very interested in what it takes to maintain overall good health, especially as we age. What better time than Women’s Health Week to present important tips, which if observed, will make a positive difference in your lifestyle. Our bodies depend on water to function so It is no secret that drinking water is the very best thing you can do for yourself. How much water is enough water to drink every day? Most authorities say 8 glasses a day but what exactly is 8 glasses of water? A good rule is to take your weight and divide by 2. That is the amount of water in ounces that you should be drinking daily. Of course, if you are exercising, if the heat index is high, or if you have special health considerations, you will need to drink more. Maintaining a consistent habit of drinking enough water each day will lead to better overall health. Because water is vital to your existence, it is absolutely critical that you have access to a safe water supply. If you live in a drought stricken area or an area subject to floods or if there is a transportation shut down making the delivery of water impossible, you could be putting yourself (and your family) in grave danger by not being able to have access to clean drinking water. How can you stave off unpredictable disasters? Save water. Keep an ample water supply on hand just in case of an emergency. On the blog, Food Storage Made Easy, the authors recently posted a series on water storage. I invite you to take a look and start today in saving water for yourself and your family. Sound advice that may be the difference between life and death for you and your family. 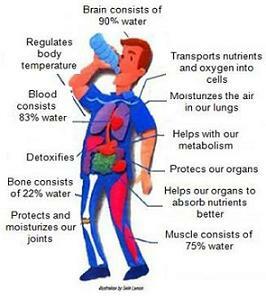 Do you drink enough water? Are you saving water? You have one basic but very factual tip. I agree that water plays a very important role in women’s health. Women are very workaholic just like men and they need the same health care as the other does.